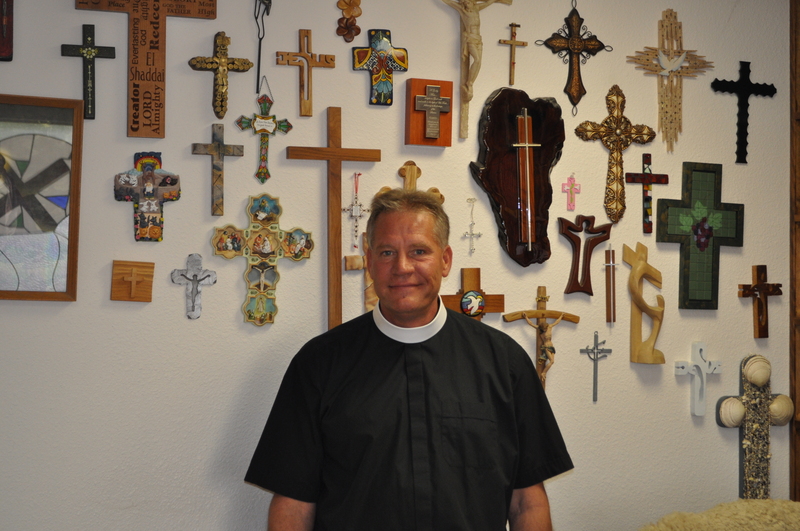 Kevin L. Kolander, born February 4, 1961 in Tawas City , Michigan , was called to faith in Jesus Christ and made a member of the holy Christian church through Holy Baptism on February 19, 1961 , at Trinity Lutheran Church (LC-MS), Oscoda Michigan , the Rev. Walter C. Pieper, presiding. He is the son of Vernon and Marilyn Kolander. He has one sister, Kari. Pastor Kolander attended elementary schools in Wolfforth Texas , Spangdahlem Germany , Atwater California , and graduated from Atwater High School in 1979. At the age of 14, having been duly instructed in the doctrines of the Christian religion as confessed, taught and believed by the Evangelical Lutheran Church (LC-MS), on Sunday, May 18,1975, he made the good confession of faith in our Lord Jesus Christ and was received as a Communicant member of the Christian church at Holy Cross Lutheran Church (LC-MS), Atwater, CA., the Rev. James H. Sorenson presiding. In 1981 Pastor Kolander enrolled in the Pre-Seminary program at Concordia University Irvine, California. During his college years he served as student chaplain and spiritual life director, sang and toured with the college choir and played in the handbell choir. Having completed his scholastic requirements Kevin graduated from CUI in 1985 with a Bachelor of Arts degree in Humanities and Religion. During his last year of college he met his beloved wife, Christina who was studying for a teacher’s degree in early childhood education. They were united in Holy Matrimony at Redeemer Lutheran Church , Ontario , CA. on August 17, 1986 , The Rev. Dr. D. Ray. Halm and Rev. Norwood Blanke presiding. Kevin entered Concordia Theological Seminary, Fort Wayne , IN in 1985. He served his vicarage in the inner city of Detroit , MI at New Mount Olive Lutheran Church under the guidance of The Rev. Venice C. Douglass, where his wife began and taught a Kindergarten class. During seminary Kevin sang and toured with the Kantorei, a 10 men a cappella choir for three years. He received his Theological Diploma and Masters of Divinity from CTS on May 19, 1989 . 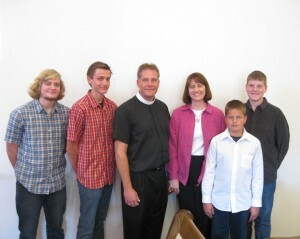 On June 25, 1989 , Kevin was Ordained into the Holy Ministry at Holy Cross Lutheran Church , Atwater , CA . Having received his first Call to serve as a parish pastor at Good Shepherd Evangelical Lutheran Church , Kingston NY , Pastor Kolander was Installed on July 19, 1989 by the Rev. Paul Wildgrube. Kevin served Good Shepherd from 1989 to 1998, and our Synod for four years as Circuit Counselor in the Atlantic District. On June 28, 1998 , the Holy Ghost extended a second Call to Pastor Kolander through the congregation of First Evangelical Lutheran Church , Lake Elsinore , CA . On Sunday, July 12, Pastor Kolander accepted the Call to Lake Elsinore . God has richly blessed the Kolander’s with four lovely children, all boys namely Adam, Austin, Noah, & Luke.